Bagheri, F., laari, M., Kamranrad, R., Jalili, M. (2018). An integrated heuristic method based on piecewise regression and cluster analysis for fluctuation data (A case study on health-care: Psoriasis patients). 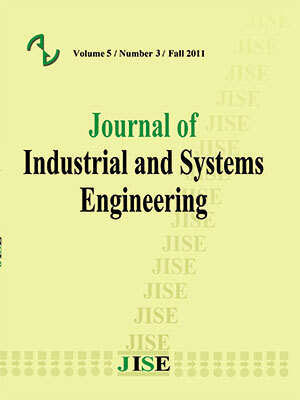 Journal of Industrial and Systems Engineering, 11(2), 175-189. Farnoosh Bagheri; mahsa laari; Reza Kamranrad; Majid Jalili. "An integrated heuristic method based on piecewise regression and cluster analysis for fluctuation data (A case study on health-care: Psoriasis patients)". Journal of Industrial and Systems Engineering, 11, 2, 2018, 175-189. Bagheri, F., laari, M., Kamranrad, R., Jalili, M. (2018). 'An integrated heuristic method based on piecewise regression and cluster analysis for fluctuation data (A case study on health-care: Psoriasis patients)', Journal of Industrial and Systems Engineering, 11(2), pp. 175-189. Bagheri, F., laari, M., Kamranrad, R., Jalili, M. An integrated heuristic method based on piecewise regression and cluster analysis for fluctuation data (A case study on health-care: Psoriasis patients). Journal of Industrial and Systems Engineering, 2018; 11(2): 175-189. Trend forecasting and proper understanding of the future changes is necessary for planning in health-care area.One of the problems of analytic methods is determination of the number and location of the breakpoints, especially for fluctuation data. In this area, few researches are published when number and location of the nodes are not specified.In this paper, a clustering-based method is developed to obtain the number and the location of breakpoints. We propose an appropriate piecewise regressionmodel to analyze the fluctuation data and predict trends of them.Theefficiency of proposed integrated approach is evaluated by using a simulated and real example, and results are compared with results of Mars algorithm. Comparison shows that proposed approach has less sum of square error (SSE) criterion than Mars algorithm with equall number of nods. Arsang, S. H., Kazemnejad, A., & Amani, F. (2011). Applying segmented regression model to analysis the trend of tuberculosis incidence rate in Iran between 1964-2008. Iranian Journal of Epidemiology, 7(3), 6-12. Bashiri, M, Kamranrad, R. (2015). Applied multivariate statistical method (in Persian), Shahed university, Tehran, Iran. Cavanaugh, K. C., Kellner, J. R., Forde, A. J., Gruner, D. S., Parker, J. D., Rodriguez, W., & Feller, I. C. (2014). Poleward expansion of mangroves is a threshold response to decreased frequency of extreme cold events. Proceedings of the National Academy of Sciences, 111(2), 723-727. Chamroukhi, F. (2016). Piecewise regression mixture for simultaneous functional data clustering and optimal segmentation. Journal of Classification, 33(3), 374-411. D’Avino, D., & Erto, P. (2008, February). A piecewise regression model for identifying the strategic inflection point for organizational change. In 10th QMOD Conference. Quality Management and Organiqatinal Development. Our Dreams of Excellence; 18-20 June; 2007 in Helsingborg; Sweden (No. 026). Linköping University Electronic Press. De Andrés, J., Lorca, P., de Cos Juez, F. J., & Sánchez-Lasheras, F. (2011). Bankruptcy forecasting: A hybrid approach using Fuzzy c-means clustering and Multivariate Adaptive Regression Splines (MARS). Expert Systems with Applications, 38(3), 1866-1875. Ferrarini, A. (2011). Detecting ecological breakpoints: a new tool for piecewise regression. Computational Ecology and Software, 1(2), 121-124. Ekman, T., & Kubin, G. (1999). Nonlinear prediction of mobile radio channels: measurements and MARS model designs. In Acoustics, Speech, and Signal Processing, 1999. Proceedings., 1999 IEEE International Conference on (Vol. 5, pp. 2667-2670). IEEE. Greene, M. E., Rolfson, O., Garellick, G., Gordon, M., & Nemes, S. (2015). Improved statistical analysis of pre-and post-treatment patient-reported outcome measures (PROMs): the applicability of piecewise linear regression splines. Quality of Life Research, 24(3), 567-573. Hong, A., & Chen, A. (2012). Piecewise regression model construction with sample efficient regression tree (SERT) and applications to semiconductor yield analysis. Journal of Process Control, 22(7), 1307-1317. Jafari-Koshki, T., Hosseini, S. M., Arsang-Jang, S., Amini, M., & Faghihimani, E. (2015). Trends of diabetic nephropathy prevalence in Isfahan, Iran, during 1992-2010. Journal of research in medical sciences: the official journal of Isfahan University of Medical Sciences, 20(10), 944. Jalili, M. (2015). Developing robust prediction model for passenger demand and cargo shocks in iran’s air industry using piecewise regression (in Persian). John Lu, Z. Q. (2010). The elements of statistical learning: data mining, inference, and prediction. Journal of the Royal Statistical Society: Series A (Statistics in Society), 173(3), 693-694. Leathwick, J. R., Rowe, D., Richardson, J., Elith, J., & Hastie, T. (2005). Using multivariate adaptive regression splines to predict the distributions of New Zealand's freshwater diadromous fish. Freshwater Biology, 50(12), 2034-2052. Leathwick, J. R., Elith, J., & Hastie, T. (2006). Comparative performance of generalized additive models and multivariate adaptive regression splines for statistical modelling of species distributions. Ecological modelling, 199(2), 188-196. Lee, T. S., Chiu, C. C., Chou, Y. C., & Lu, C. J. (2006). Mining the customer credit using classification and regression tree and multivariate adaptive regression splines. Computational Statistics & Data Analysis, 50(4), 1113-1130. Lee, T. S., & Chen, I. F. (2005). A two-stage hybrid credit scoring model using artificial neural networks and multivariate adaptive regression splines. Expert Systems with Applications, 28(4), 743-752. Malash, G. F., & El-Khaiary, M. I. (2010). Piecewise linear regression: A statistical method for the analysis of experimental adsorption data by the intraparticle-diffusion models. Chemical Engineering Journal, 163(3), 256-263. Marsh, L. C., & Cormier, D. R. (2001). Spline regression models (Vol. 137). Sage. Matthews, T. J., Steinbauer, M. J., Tzirkalli, E., Triantis, K. A., & Whittaker, R. J. (2014). Thresholds and the species–area relationship: a synthetic analysis of habitat island datasets. Journal of Biogeography, 41(5), 1018-1028. Muggeo, V. M. (2003). Estimating regression models with unknown break‐points. Statistics in medicine, 22(19), 3055-3071. Muggeo, V. M. (2008). Segmented: an R package to fit regression models with broken-line relationships. R news, 8(1), 20-25. Strikholm, B. (2006). Determining the number of breaks in a piecewise linear regression model (No. 648). SSE/EFI Working Paper Series in Economics and Finance. Trevor, H., Robert, T., & JH, F. (2009). The elements of statistical learning: data mining, inference, and prediction. Toms, J. D., & Lesperance, M. L. (2003). Piecewise regression: a tool for identifying ecological thresholds. Ecology, 84(8), 2034-2041. Werner, R., Valev, D., Danov, D., & Guineva, V. (2015). Study of structural break points in global and hemispheric temperature series by piecewise regression. Advances in Space Research, 56(11), 2323-2334. Xue, Y., Liu, S., Zhang, L., & Hu, Y. (2013). Integrating fuzzy logic with piecewise linear regression for detecting vegetation greenness change in the Yukon River Basin, Alaska. International journal of remote sensing, 34(12), 4242-4263. Yang, L., Liu, S., Tsoka, S., & Papageorgiou, L. G. (2016). Mathematical programming for piecewise linear regression analysis. Expert Systems with Applications, 44, 156-167. York, T. P., Eaves, L. J., & van den Oord, E. J. (2006). Multivariate adaptive regression splines: a powerful method for detecting disease–risk relationship differences among subgroups. Statistics in medicine, 25(8), 1355-1367. Yu, J. R., Tzeng, G. H., & Li, H. L. (2001). General fuzzy piecewise regression analysis with automatic change-point detection. Fuzzy sets and systems, 119(2), 247-257.